It’s all treats today at Seton High School as we made a very sweet announcement to our students, faculty and staff. 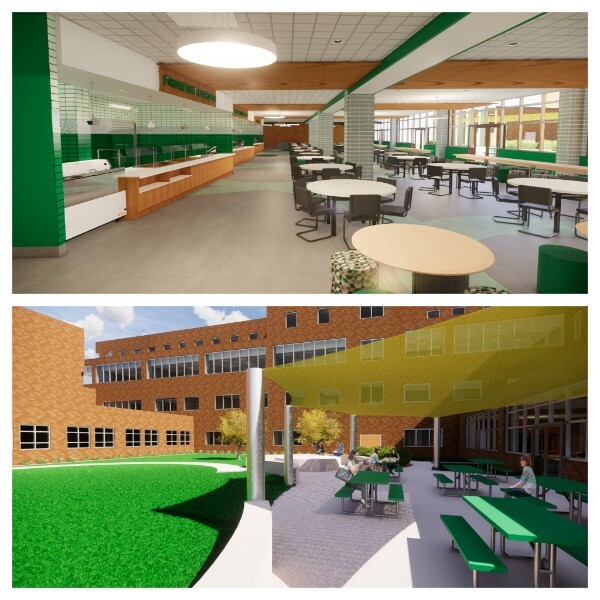 Coming in August 2019, the cafeteria and courtyard are going to be remodeled into a gathering center for our students. This $2M renovation, donated by anonymous donors, includes a redesign of both areas of our campus. The cafeteria will feature more dining options, a coffee shop, beautiful new furniture, charging stations, energy-efficient lights, windows and HVAC. The courtyard is one area of the campus that is currently under-utilized. The redesign will include outdoor classroom space, outdoor dining, gathering spaces and a spirituality garden. In addition to supporting student learning, the area will also be used for special events and class activities. Click HERE to view the video renderings. This amazing transformation is due to the immense generosity of anonymous donors who value the importance of a Seton education and are dedicated to providing students with the best possible amenities to foster learning, team building, leadership and the overall spirit of the Seton sisterhood. This is part of the Seton 360 initiative. The construction will begin in the spring of 2019 and will be completed in August 2019. In addition, the donors would like the students and staff to come up with a name for the new space. Since this is much more than a cafeteria, we would like a name that reflects the true spirit and vision for this area. Students, faculty and staff can submit nominations for the name with an explanation (no longer than four sentences) as to why they like this name. All submissions are due by January 11, 2019. The winner will receive a $500 gift certificate and a limo ride to Kenwood Mall this spring, a free lunch the first week of school and their pick of lunch tables for the first week. To submit a name, click HERE. We are grateful to the donors for their amazing support and generosity. This will truly transform our campus and provide our students with a beautiful new space to foster learning and growth. Please continue to keep our students and staff in your prayers. And as we told the students today, say an extra prayer of thanksgiving for the amazing donors who give so generously to support the mission of Seton.